Mischa is a well-connected writer and editor with a broad range of interests and a depth of knowledge in food and wine. The actual experience is very different, a relaxed affair, that involves a lot of friendly advice. It’s worth bearing in mind that your suit can last decades, so it’s worth doing some homework and spending time discussing your options with your tailor. In fact, it’s a warning sign of a bad tailor that they will try and hurry you or convince you that it’s possible to run up a decent suit in 24 hours. 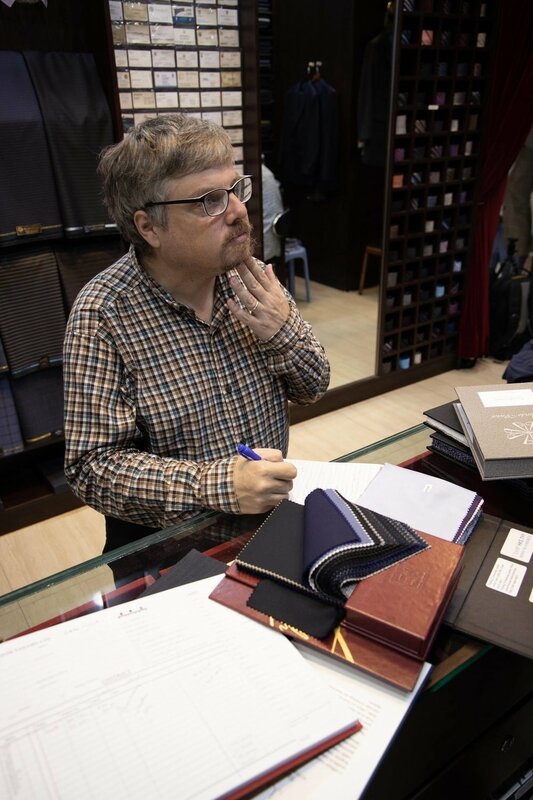 There is a lot to discuss and the first of my three meetings at the Empire International Tailors is more like an introduction to the world of suits than a clothes-shopping experience. Being measured is quick and not intrusive and takes up the smallest part of the meeting. We discuss what is appropriate for a first, all purpose suit. The color of the suit is the first decision to take, with blue or grey suit styles the top recommendations. I was thinking about black but it’s pointed out to me that this looks funereal. I opt instead for a midnight navy blue suit color that is almost but not quite black. These types of subtle differences are crucial in tailoring -- next we discuss fabric thread count. A thread count of 110-120 means the fabric is durable and not too fragile and therefore appropriate for an everyday suit. To get technical for a second, thread count is the number of vertical and horizontal threads in a square inch and while a higher count may seem more impressive -- and certainly produces a finer fabric -- it also makes a more fragile one. The next choice is fabric weight. While a heavier fabric of 300 grams per meter sits better on the body, anyone planning on wearing their suit in a hot, humid climate should compromise on a lighter weight of around 260-270 grams per meter. The fabric under discussion is pure wool from a merino sheep, the standard for a general purpose suit. A suit for a wedding or other special occasion might be a wool/silk blend but its increased fragility means it will be in the wardrobe far more than worn. While these aspects of a suit reflects its practical purpose, others can reflect the wearer’s personality and fashion sense. There is no shortage of suit wearers who ask to look like style icon David Beckham. For an understated look, there are patterns such as birdseye, nail head or herringbone -- these patterns can be so subtle that they are almost invisible at a distance. A subtle or pattern-free fabric makes for a suit that can be worn on almost any occasion. If you are a bit more cocksure you could plump for a bold chalk stripe, although even in Britain pinstripes have been falling out of fashion for some time. In the end I decide on an Italian fabric from Giorgio Vallino that will be suitable for the Hong Kong climate. Next up for discussion are some style details and we venture into territory that I didn’t even know existed. Buttons come in ox horn or synthetics. Who knew? Horn buttons are an amberish brown or grey color and are fairly standard but vegans prefer synthetic suit accessories. The front of the suit jacket will have two, never three buttons and each sleeve will have four button holes, one of which can be a different color. Do I want two side vents or a centre vent? The centre vent is a little old-fashioned, back when suits looked boxier while side vents are more practical. I opt for side vents for my suit, as they make sitting down, standing up and putting your hands in your trouser pockets easier. I’m also told they help give an hour-glass effect on the figure. As I am a beer-glass shape, this can only be positive. I also choose to have two pockets and go without a ticket pocket, which might be useful but looks a little fussy to my eye. We also have to consider the lapels. Standard lapels have a notch shape at the top and are the most common. A ‘v’ of missing fabric is on the horizontal aspect while the more bold peak lapel has the ‘v’ on the vertical. The lapel can, of course, also have a buttonhole and a connoisseur might well choose a handmade Milanese one, which is difficult to make and a sure but subtle sign you are wearing a bespoke garment. Suit lining is another way for the wearer to express their individuality, with pattern options ranging from conservative to funky, such as guitars or an image of Charlie Chaplin. Plain linings are likely to be silk, while patterned ones a silk and polyester mix. As soon as you take your jacket off, you are giving an obvious sign that you are wearing a garment made for you if you choose a pattern. The suit lining can be full, covering the entire inner back of the suit jacket or for really hot weather, half. So far we have been talking about the jacket, so no attention turn to the trousers. Pleats that give room to expand are an option, but one I choose to go without as I am hoping to lose rather than gain weight in the future. I do however opt for cuffs or turn-ups on the trouser leg, on the advice that they help the trousers sit a little better. With the shirt the areas to consider are the color, collar, the cuffs and the placket. The what? The placket is a double layer of material down the front of the short where the button holes are placed. It’s optional. Color is of course entirely optional too, but the advice is that a light shirt goes with a dark suit. The idea is that when you wake up in the morning and are heading for an appointment, you can just put on your shirt and suit without facing a big, time-consuming dilemma about what to wear. Sleeves can end in barrel cuffs, with buttons or French cuffs, for cufflinks. Having chosen your cuffs, you can choose from between eight different collars for your custom shirt, with the semi-spread the preferred one, as it works equally well with or without a tie. 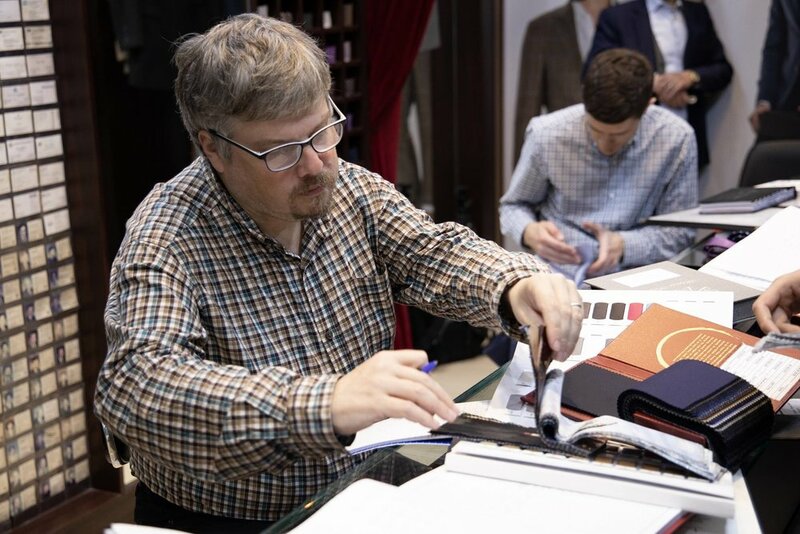 While all of this can seem intimidating, it’s worth repeating that this kind of education in clothing is part of the point of the fitting process and means that you are likely to get the suit you want and one that fits comfortably. A suit made in 24 hours after one session of measurements can never be the same quality and good fit. This idea is reinforced when I turn up for my second fitting and try the clothes on for the first time. While I have always known that one of my legs is about two centimeters shorter than the other, I hadn’t really appreciated that there was a knock-on effect on my shoulders. So at the second fitting there are readjustments to be made, first by an apprentice and then by the master tailor himself. The clothes are actually made by a group of older, skilled tailors in a workshop around the corner. The sewing is done by hand or on machines imported from Japan in the 1960s. So at the second custom suit fitting, we consider not only my odd-shaped body but the sit of the trousers and how much sock they might show or not and whether the jacket is sitting properly. It turns out to be a little hunched around the neck and there is some bunching of fabric on one front panel, as attempts to cater for my raised should have been made. Once spotted, these issues are easily resolved. In fact, ironing out problems such as these is the whole point of having a series of fittings. 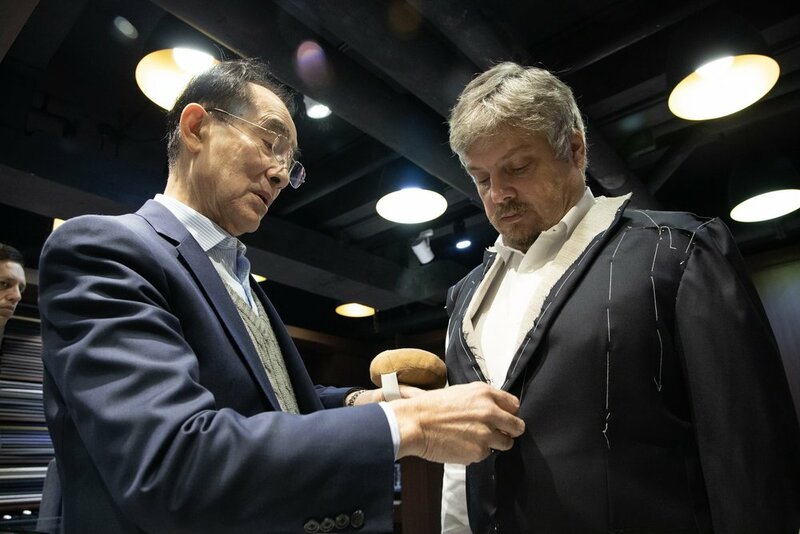 A few days later I pick up my custom suit at a third session, This turns out to be the last fitting for me but there had been another problem, this would have been an opportunity to spot it and deal with it.